Forget ripping up old concrete floors just because of a few damp patches! 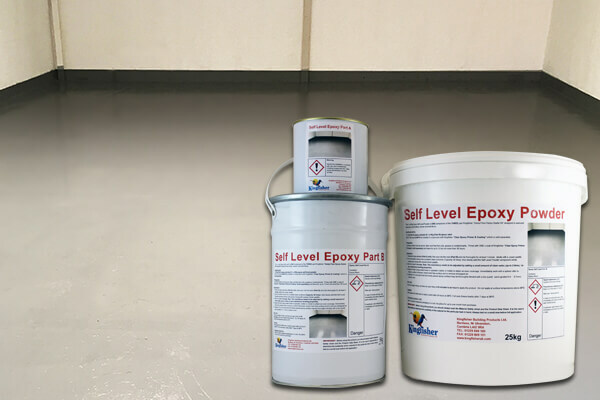 Damp Floor Epoxy Sealer Kit will allow you to lock moisture away. It creates a new damp proof membrane in as little as 2mm! This revolutionary floor membrane will stop damp from coming through the floor without the need for uplifting concrete. The advantages compared with digging up the concrete and laying in a conventional DPM are obvious. Our damp concrete floor sealer offers phenomenal time/cost saving and minimal disruption. We understand that rising damp and general damp problems can be frustrating. That is why we supply our Damp Floor Epoxy Sealer Kit. As well as the benefits above, another benefit to this penetrating epoxy sealer is its broad and flexible nature. This helps it to fill minor cracks as well as handling some movement. The Kingfisher damp concrete floor sealer can cover anything from retail and commercial properties to supermarkets, manufacturing plants. Concrete floors showing rising damp can be common in many properties. This can be because a damp proof membrane has failed or it wasn’t installed prior to the floor being laid. The porous nature of concrete means that damp can travel through, causing problems in the flooring above. Our damp concrete floor sealer can solve your problems with rising damp. It provides one of the most effective and reliable floor coverings available. This is one of the finest epoxy floor coatings on the market today, helping put a stop to surface water. Damp proof floor paint has the added advantage of being very easy to apply. Floor sealers are usually utilised for binding, stabilising and sealing brittle and porous substrates. This is then generally overcoated with floor paint or left as a dust-proofing sealer. Our knowledge and experience supplying concrete floor sealers have ensured that our products stand the test of time in any domestic, commercial or trade setting. Epoxy Primer is sold separately as you typically only need 1 x primer to 4 kits.